With the holidays fast approaching, you may be considering which gifts to get for whom, or how you are going to keep the family entertained when you are all confined together indoors. A video game the whole family can partake in might be just the answer; it’s a perfect gift and can encourage of hours of ‘light-hearted’ competiveness among all ages of the family. The following are not only some of the most popular, but are also some of the best. The raving Rabbids series was unveiled in 2006 with the launch of Rayman Raving Rabbids for the PlayStation, Xbox and the PC. The latest release is Rabbids Rumble for the 3DS, and there is even a Rabbids Invasion for Facebook. Each game has a unique approach, but the overall series focuses on slapstick humor and a variety of comical characters, broken down into a series of mini-games, giving appeal to younger players. The games encourage singing, dancing, jumping and a race to escape from jail. You will no doubt find yourself in fits of laughter, as you navigate your way through any number of weird scenarios. This is an action puzzle game compatible with the 3DS, Wii U and PC. In Scribblenauts Unlimited, players you have to collect ‘Starites’ to complete each game level. The emphasis is on creativity and inventive gameplay, which sets it apart from other games. For example if you needed to reach a higher platform, you can request any item you can think of to help you reach the platform, from a trampoline to a ladder! You can play around with different objects to find the most fun or efficient method to reach a Starite, ensuring for some great family banter as you decide whether to whether to build a bridge or hand glide across the gap! You may have already heard this game’s name in passing, as it is hugely popular among all ages, both male and female. The game itself, however, has no set goal. You are placed in an open universe full of resources and encouraged to build as big as your imagination allows. You begin with simple tools and must harvest the necessary, including wood, stone and iron to build shelters, craft items and even build complex machines. There is also a ‘survival’ option in case you are so inclined to battle zombies and other creatures with weapons you yourself have crafted; but don’t worry if you are not so inclined, the creative mode purely encourages building and crafting. Minecraft players have been known to create everything from starships to castles to entire cities. Rock Band is a fantastic game for the whole family to join in on. With replica guitars, microphones, keyboards and a drum set, everyone will be rocking out to their favourite pop songs. It’s a team game, allowing for fellow band members to support those of us who aren’t necessarily the most musically gifted, and you win points by correctly timing the notes according to the on-screen prompts. There is definitely a reason why Rock Band is one of the most popular franchises in the world: it is hard to beat for its sheer party game fun! New Leaf is the latest edition to the Animal Crossing series, and it is a game of exploration. As a villager in a small rural town, you can explore and interact with other residents (mostly anthropomorphic animals), performing activities to earn in-game currency, which you can then use to build and renovate your house as well as buy clothing and furniture. The overall objective of the game is to “make the town a better place to live” with the help of many colorful characters. The game also features an online element that allows you to exchange messages with friends or play mini-games together to win in-game rewards. 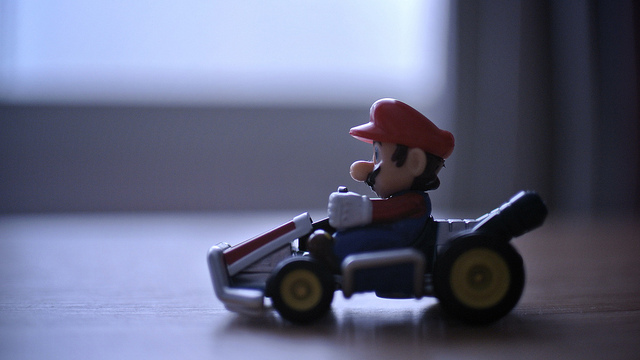 Mario Kart is an exceptionally fun game to play with group of friends and family. You can either choose to play with a steering wheel or a controller, as you navigate your chosen Marion character around 32 unique tracks, from castles to glaciers. You can partake in time trials, or simply race against one another, throwing obstacles in your opponents’ ways, which can be anything from a slippery banana to a bomb disguised as a turtle! Victoria Stevens is a graduate who writes with Gift Library. She loves video games and the more traditional board games, and becomes extremely competitive when playing either.